Is your church looking to make first steps to re-engage its community? Or are you caught up in the missional vs. attractional discussion? Google “missional vs. attractional” and you’ll find a slew of blog posts, articles, and books referencing the divide between two ways of doing church. Over the last few years, I’ve talked with several churches that realize their mistake in being solely an attractional church. In the process of spending all their energy in a “come to us” approach, they’ve accidentally withdrawn from the community. One church even opened a dog park as a community service, but no one from the church visits the park to get to know the people. AND: The Gathered and Scattered Church (Exponential Series) is a book aimed at churches that want to reengage their community, or make their first steps in that direction. 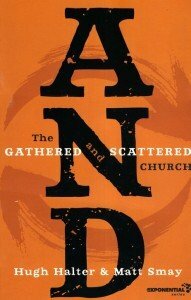 The authors, Hugh Halter and Matt Smay, wrote AND: The Gathered and Scattered Church (Exponential Series) to call the church past the “missional/attractional” divide that has grown over the last 5-7 years to a place where we can affirm and recognize the need both to gather and to be sent together as a community. Halter and Smay, who previously co-authored The Tangible Kingdom, help lead the Adullam community in Denver, Colorado (at the time of this writing – he has now left). From their own experience, they see that there is a natural struggle to find a balance of scattering people into incarnational mission but that there is also a significant beauty and meaning in corporate gatherings. This book speaks more to the practice of missional community versus theology of missional practice. Much of their stories reflect their own experience in developing their church. how to move a church that is strongly attractional and inward focused, and help its people understand missional living via avenues for ministry outside the walls of the church. For me, Chapter 4 was the core of this book. They talk about spiritual formation as a disciple. Whereas some traditional models of discipleship focus on knowing about Jesus (or theology, or other wonderful content), these writers define spiritual formation as becoming like Jesus, rather than just knowing about Jesus. In this process, churches are encouraged not to rush an assimilation process, but allow newcomers to observe first what your church is doing. They suggest short windows of commitment to see if they want to get involved. Another way to say this is simple next steps. During this observance phase, there must be a time where people get to hear the story of the church, and a chance to share their own story. It’s a time where people decide if their story matches up with your church’s story. As I moved through this chapter, I found myself highlighting and agreeing with much of their writing. I think you will too. Chapter 6 is focused on how to move from Gathered to Gathered and Scattered.” It more on a theoretical level of leading a shift, rather than practice, in part because missional practice is entirely connected to the ministry context. Since the days of Abraham, God’s people have been a missionary community, a people for God to “give away” to the world. And God continues that purpose in the church today. Actually, church is something everyone should be a part of, but it’s different than being a faith community. Church happens when a group of people decide to go on mission with God together. God’s church is a missional church, a community that is sent and given away for God’s purposes. The reason all of our church forms fail to produce the fruit we see in Scripture is because we approach church as everything but a missionary community. So how does a missionary get the context? We do it by becoming friends with people. Being incarnational is not so much about our direction; it’s more about how we go, what we do as we go, and how we are postured in the culture God calls us to engage. Incarnation is the personality of our proclamation. Engaging culture isn’t as much about doing evangelism as it is incarnating the presence of Christ in every relationship we form. If we fail at engaging well and living as Christ would live among our neighbors and friends, we fail as missionaries and the culture doesn’t see the visible beauty of the sent church. My hope for this book is that it will push the church, in all forms, to find God’s balance: gathering people well AND missionally scattering them as incarnational communities. People will naturally gravitate toward experiences that are meaningful, and the most meaningful experience a person can have in this life is to feel connected with God—to know that God is leading their lives, challenging them, interacting with them, and using them to change the world. Calling people to leave their nets, to prioritize God’s mission over their own, to live by faith, to take up their cross, to deny self, and to seek first God’s kingdom and righteous life is what seekers are so desperate to hear. AND, by Hugh Halter and Matt Smay, asks and provides an answer for one of the most important questions for church leaders today: What is happening to the church in America? By all appearances, it looks like we are ‘doing’ church better than we ever have. In the past thirty years the number of mega-churches has increased from under 100 to over 7,500. In the past ten years the number of multi-site churches has increased from under 100 to over 2,000. By the numbers, these church movements enjoy the national platform, the national voice, and the resources to profoundly impact the Kingdom. In spite of the rapid growth of these prevailing church movements, why is the Western church still in massive decline? Numerous books have been written documenting the flight of members from the institutional church. This is not another book about how to do church better or how to just get people back into the pews. AND helps you—-whether you are a mega-church, traditional, contemporary, or organic church leader—-focus on the vast majority of unchurched Christians and non-believers who are not moving toward any form of church. You will learn how to value existing church forms—-attracting people to a physical church and releasing people into hands-on ministry … bringing together the very best of the attractional and missional models for church ministry. AND will equip you and all church leaders to value existing church forms while catalyzing a missional movement of incarnational people into the world for Jesus Christ. AND is the second book in the Exponential Series—-a partnership between Exponential Network, Leadership Network, and Zondervan featuring several signature books each year to tell the reproducing church story, celebrate the diversity of models and approaches God is using to reproduce healthy congregations, and highlight the innovative practices of healthy reproducing churches.